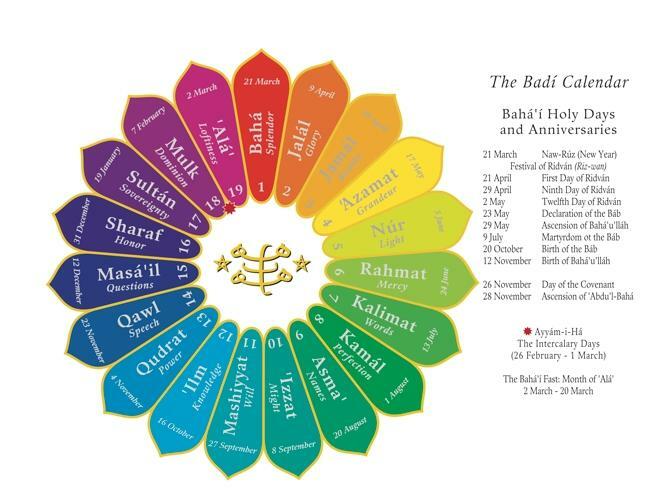 The Bahá'í calendar, or Badí calendar, was first established by the Báb in the Kitáb-i-Asmá (The Book of Names). Bahá'u'lláh later confirmed the calendar. The calendar is made up of 19 months of 19 days each, with an intercalary day period of four days (five during leap years). The new year (Naw-Rúz) begins on the March 21st of the Gregorian calendar, but is tied to the Spring Equinox so it is possible that it could be celebrated on the 22nd of March in some years. The Bahá'í calendar is currently tied to the Gregorian calendar, meaning that a given date on one will always coincide with a given date on the other. (For example, the 9th of Kalimát will always be equivalent to the 21st of July). This comes as a big relief to people designing hybrid calendars for the web. The Bahá'í Era, or Badí Era, began at sunset on March 20, 1844. Copyright © 2015 Spiritual Assembly of the Baha'is of Shawnigan Lake, Cowichan Valley, BC.